That’s right folks, I’ve spent most of my time in Florida in Daytona Beach. Instead of overloading one or two posts with info I figured why not split it up into several parts! More fun! So I’d like to share with you one story from the Daytona Beach history books that always puts a smile to my face. The story of Brownie the town dog. The year, 1940. The town, Daytona Beach. The dog, Brownie. It was a hot summer day. The black asphalt burned the poor mutt’s paw but he barely noticed the pain. He owned the town. A nameless vagrant on the hunt for something – maybe food, maybe shelter, heck maybe he was just looking for someone to love. And then he found the shade. A little piece of shadow that unbeknownst to him, would change his life. 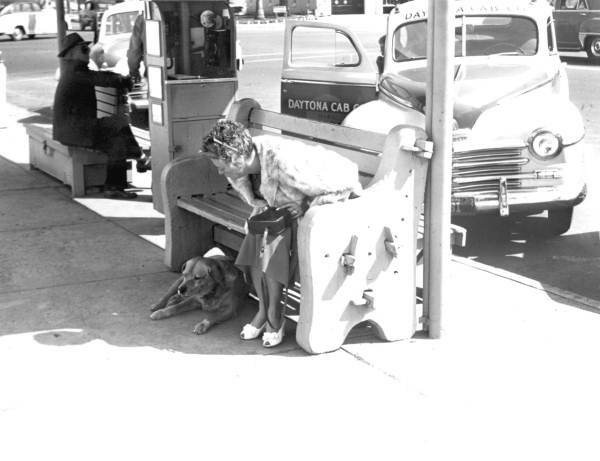 Brownie rested underneath the awning of the Daytona Cab Company and before he knew it he had more than one best friend. The cabbies here weren’t just looking for some cheap fare with Brownie. They pooled their tips together to build him a doghouse. A little jar was left by this house for donations and before they knew it the whole town was pitching in, paying for his food and veterinary bills. Eventually the donations got so grand they had to deposit the dough in Brownies own account at the Florida Bank & Trust. Everyone in town, adults, children, tourists and locals, they all got to know Brownie, he really became the town dog. The cabbies would even buy him a pint of ice cream everyday. They called Brownie the number one goodwill ambassador for the town of Daytona. 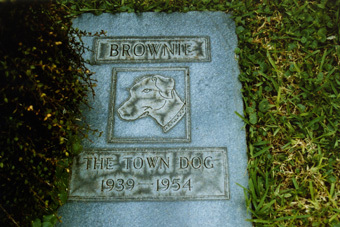 Then one sad day in 1954, Brownie died of old age. There was enough money in his bank account to purchase a casket and headstone. Seventy-five people attended Brownie’s funeral. The mayor read a tearful eulogy. The city of Daytona Beach had lost a best friend. Today you can still visit Brownie who resides in the beautiful Riverfront park in Daytona’s downtown district. In 2007 there was even an official Brownie Festival that included a Brownie look-a-like contest. Some people even claim to have seen his ghost or felt his presence while visiting his resting place. A little dog topiary guards Brownie’s grave. If you find yourself in Daytona, go say hello! ALSO I would like to introduce this amazing website I found Florida Memory. They’ve given me permission to use photos from their site, I can’t wait to share more from their collection! P.S. I wasn’t able to find my own pictures of Brownie’s grave so I’m using these borrowed ones temporarily. 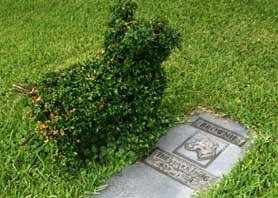 i like how the real brownie looks like a cute scrappy fella, yet the dog portrayed on the gravestone looks like a vicious doberman!